New Industrial Fixed Foam System Launched. 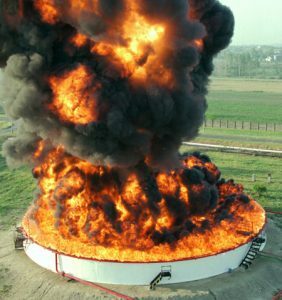 A new fixed foam system can extinguish a refinery fire, full surface tank fire or rim seal fire without the use of pumps or external energy. Pressurised Instant Foam is a medium/large-scale fixed extinguishing system for use in any facility that relies on foam to extinguish fires. Uniquely, it does not need any external energy source to produce and deliver the foam to the burning combustible liquid. The company behind the technology, Swiss Fire Protection Research & Development, was established in 2016 by its inventor, Istvan Szocs, who had previously developed the first and second-generation technology under the separate brand name Foam Fatale . In a nutshell, the system consists of a system of pipes that guides the fire-fighting foam around the facility being protected, such as a storage tank, and applies the foam onto the fire inside the tank through apertures at the end of the pipework. In contrast to traditional fixed technology, the PI Foam system does not require the use of pumps, foam chambers, foam generators, foam proportioning systems or foam pourers. Andras T Peller, director at Swiss Fire Protection Research & Development, explains that at the heart of the system is a pressurised vessel that contains a premixed foam concentrate/water solution. The vessel is pressurised by the introduction of a gas mixture that is designed to dissolve inside the foam premix solution. The gas mixture varies according to the features of the stored product and environmental factors ie whether the vessel will be in a cold or hot climate, which affects the pressure requirements . “When it is depressurised, it is like a soda can. The bubbles are released as the gas comes back to atmospheric pressure. So you have instant foam produced from the foam solution, and you do not have to do anything. The pressurised gas does all the work,” he says. 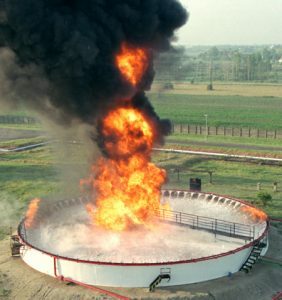 The fast activation is crucial to the successful deployment of the system; the system is designed to cover with foam the full surface of a storage tank in three minutes. An obvious benefit of the fast application of foam without human intervention is that there is no scope for human error during the set-up of mobile emergency-response resources to produce the right amount of foam, at the right concentration, under highly stressful circumstances. “We are creating the foam in a calm environment, not during a blaze, measuring and checking the gas pressures,” he says. The three-minute rule is also significant for another reason, explains Peller: at five minutes, the steel tank wall begins to reach the 500°C mark, the temperature at which steel begins to lose its structural strength. “So after the fire the tank has to be demolished or repaired. If you can put the fire out before it reaches that limit, you can save the tank and basically just clean and refit it afterwards,” says Peller. 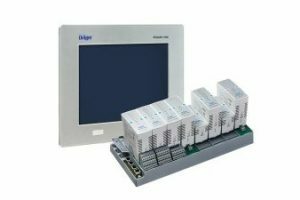 In addition, as the volume of foam in the PI Foam system is pre-calculated, there is no possibility of the foam overflowing the tank or, indeed, of foam being lost during application as would be the case with a large-scale monitor. “The ideal situation is for the firefighters to attend the incident without putting themselves at risk. 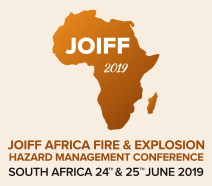 Various studies have established that even in an optimal case, only around 50% of the foam generated by monitors ever reaches the surface of the fire, due to targeting loss and updraft. That is a lot of foam that could be contaminating the environment,” says Peller. The intention of the system, however, is not to take jobs away from industrial firefighters or doing away with emergency response equipment, highlights Peller. “Fixed systems can only put out the fires for scenarios that can be prepared for, but what about scenarios you haven’t thought of? Ideally a tank farm manager would protect his whole site with this, but would still retain a smaller mobile unit,” remarks Peller. SFPRD has tested the performance of a number of foams with its innovative system. The company can recommend commercial, off-the-shelf foams, but it has also developed a fluorine-free alternative that it is currently undergoing various approvals. “It is available and usable if the client accepts that the foam is tested under non-standard conditions, because of the different foaming principle. The difference is that commercial foams are designed to be aerated, but this application doesn’t use air, it uses soluble gas, which is why we’ve had to test many foams on different fuels, including ethanol,” he explains. In practice, the vessels containing the premix solution are pressurised on site when the installation takes place. Depending on environmental factors – namely temperature and where the vessel is stored – the foam is replaced every five or ten years. Top-ups can be made as and when required, but Peller emphasises that one incident would be unlikely to deplete the whole foam reserve. The pressure of the system is monitored automatically and the valves self-test; regular maintenance is a matter of taking a sample of the foam mixture and having it checked in a laboratory. The system is scalable, which means that protecting an additional storage tank, for example, would be a case of installing extra pipework and perhaps installing a larger pressurised container. There is no need for purchasing additional machinery or replacing existing pumps with bigger units, as with a traditional system. “The NFPA requires around 4.2l/m2 per minute and we can easily scale up the system to 40 or even 80l/m2 per minute, just by up-scaling the system,” explains Peller. 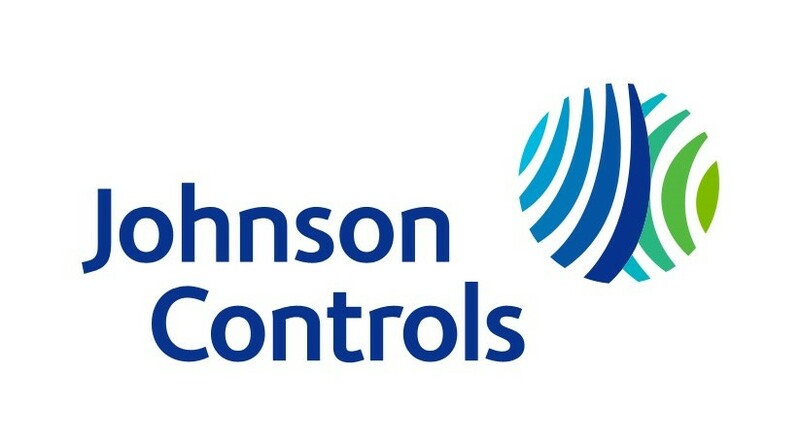 This year the company is hoping to complete an on-going retrofit installation on Chevron Kuwait’s facility in the neutral zone between Kuwait and Saudi Arabia. Construction of the system on the site was stopped in the middle of the process in 2015 due to a dispute between the two countries, but is hoped to restart shortly. Here, the PI Foam system will be protecting ten storage tanks measuring between 57m and 77m in diameter. 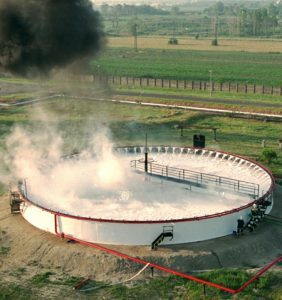 For this project, the specification requires the capability of the PI Foam system to simultaneously extinguish three full-surface tank fires and seven rim-seal floating roof-tank fires. The system design consists of a pressurised vessel containing 800m3 of foam solution and a 2km-long underground network of piping. For a rim-seal fire, only enough foam is released to extinguish the fire: “We don’t want to flood the whole roof because that would risk it sinking and causing a bigger problem. We have a detection system that can differentiate between full surface and rim-seal and, in the case of a rim seal fire, Pi just fills the rim seal area,” says Peller. Swiss Fire Protection is not just focusing on the oil and gas industry. In Hungary, it is working with pharmaceutical giant Sanofi and the Hungarian Army, with the latter to protect a strategic kerosene storage facility. Discussions are under way with an airport for the protection of a filling station and a storage tank containing kerosene. In addition, a small independent storage terminal wants to extend a first-generation version of the system and use the pressurised foam vessel to protect the whole storage facility, which includes multiple tanks, dike areas, pump stations, filling stations and other industrial areas. In order to try to gain wider market acceptance for Pi Foam, the company is engaging with relevant industry bodies. “One of the problems is that some standards refer to the performance of pumps but our system doesn’t use one, so we cannot comply directly. We have to prove that the performance of our system is the equivalent or better, and are currently in discussions with Lastfire about creating a test protocol,” says Peller. Whether this innovative system will become commonplace in the future is open to question. 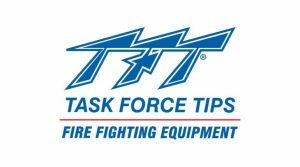 After all, the highly conservative fire industry is as fond of its existing technology as it is of is slowly evolving standards.